It's good to be first to market, first to feature. But the wiki market is heating up with new entrants. so we have to stay at the forefront of innovation. 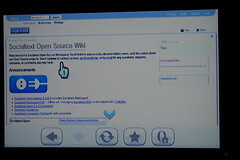 This week, a new competitor to the space, Atlassian Confluence, made their wiki run on a Wii. While I don't dispute the potential of this handwaving technology, their co-founder, whom I've yet to meet, claims is the first enterprise wiki on a Wii. Sorry, Charlie, Socialtext is the first enterprise wiki to run on a Wii, it is called a Wiiki (oh, right, you called it that too) -- Luke Closs did it a month ago. Andrew McAfee and Karim Lakhani created the first Harvard Business School case on Wikipedia which is available for free online and published under the GFDL. The case explains Wikipedia mechanics and the story of the Enterprise 2.0 article for deletion debate. 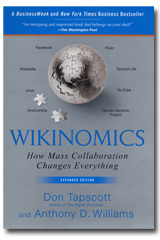 I guess we now have peer reviewed evidence that not only does Enterprise 2.0 exist, but Wikipedia exists. Why Nupedia (Wikipedia's more formal predecessor) failed to gather momentum, and why Wikipedia has gathered so much. Whether Wikipedia's highly egalitarian and freeform editing processes and policies yield good results and, if so, how this happens. How decision rights are allocated in Wikipedia. The merits of the Inclusionist and Deletionist perspectives. Whether Wikipedia really has become a "post-revolutionary Bolshevik Soviet, with an inscrutable central power structure wielding control over a legion of workers." If Wikipedia's policies are being correctly followed, what the fate of the "Enterprise 2.0" article should be. One week into the experiment, Politicopia is working. Citizens are participating and citizens are being heard. Legislators are talking to me about things they’ve read on Politicopia. Because of input I received, I have changed a position I've held for years. Already, citizens are using Politicopia to shape the debate. As a matter of fact, a reporter emailed me, to ask why Politicopia wasn't linking to her article. That has never happened in the two-plus years I’ve been blogging. Politicopia joins the revolution to improve people's ability to understand and control their government. Politicopia starts with three simple notions. 1. People need more control over government. 2. Insiders have too much control over government. 3. The Internet will disintermediate government. In politics, intermediaries tightly control information. Those intermediaries are (1) special interest groups, (2) the media, and (3) bureaucrats. There's nothing wrong with the fact that those three entities exist; they can be quite helpful in proper dosage. The problem is the overwhelming degree to which those intermediaries filter content and control political dialogue. Citizens can elect representatives, lobby if their interests are special enough (institutional pluralism) or go public with campaigns that appeal to change (individual pluralism) with great effort and cost. But citizens have had no role in sausage making, let alone transparency into the process of legislation. When citizens collectively disintermediate politics, emergent democracy happens. The people must wrest control from the intermediaries. How? By (1) improving access to information and (2) improving the ability to organize. Politicopia will improve people's access to information in my state, Utah, by presenting a wiki-based forum for the compilation and presentation of information on actual bills pending before the Legislature. If a citizen wants to learn about an issue and shape the dialogue, Politicopia will provide a quick and solid handle on the process -- without the intermediaries filter. And if a legislator wants to hear unfiltered suggestions from interested citizens -- instead of mainly hearing from organized special interests -- Politicopia will give him or her a new source of input. Using a Socialtext wiki, Politicopia will list the bills, present a brief summary of the issue and the bills status, invite pro and con arguments and comments, and provide links to relevant sources. Users will provide and control the content. Adding a forum where commentary and links can be added to the great information already provided on the Legislative website, Politicopia should become a very useful source for quick, accurate information on issues that the peoples representatives are deciding in Utah. Please check it out and help supply content or start a site for your state, city or mosquito abatement district. For more on Politicopia, see Phil Windley, Doc Searls, Brit Blaser, David Weinberger and Micah Sifry. I'm encouraged to see social software employed in politics for more than campaigns and become a new valve for the heart of the legislative process. Someone told me at a conference last month that I should get back to sharing the process on my blog. Well, work is going so damn well that I don't have enough time for it. But one transformation has been underway for a while that lets others at Socialtext share the process. I just blogged about how our development team is blogging their work at Socialtext.com. Unlike the rest of them, I'm only half German. Also, if you code, mark your calendar for our open Wikithon in two weeks.